More shimmering shades of green than a box of paints. Gently rolling land with hundreds of acres to wander. A place to restore your spirits. A place that slips you into a different world. Creature comforts embrace you. You can be as busy or as quiet as you like. 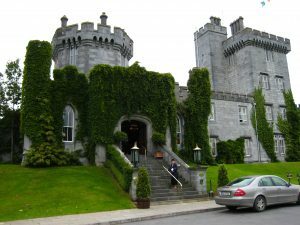 Welcome to the Dromoland Castle Hotel in County Clare Ireland, a mere eight miles from the Shannon Airport. Make your way up the narrow winding drive amidst hues of emerald trees. Camera ready? Go carefully; local geese frequent the road. Past the Golf and Country Club, the lane rises, crests. Before you looms the 16th century, blue limestone, Castle with its Gothic towers. Perfectly groomed Victorian lawns and gardens extend to the forest and lakes. Climb the 16 stone steps and be welcomed by liveried bellmen. The friendly staff at Dromoland enjoy sharing the magic of a bygone era. They treat you like the nobility that Dromoland has hosted since rebuilt in the 1500s. This 450-acre estate was the home of the O’Brians of Dromoland who trace their lineage to Brian Boru, High King of Ireland over 1000 years ago. Throughout this richly appointed five star hotel, restoration focused on reviving the elegance and luxury of the Victorian era, complete with modern amenities. Ancestral paintings adorn wood paneled walls. Stately stairways curve to the upper floors. Cozy chairs beckon. Sit, relax, and chat. Your total comfort is behind the design and decoration of each unique guest room. Signature slippers and robes, custom linens and wall coverings, invite you to relax and let go of your hectic pace. Gaze out of your windows on the serene gardens and ponds as you record today’s memories in your journal. Surrounded by nature, stroll through the gardens. Take a tour of the extensive grounds. Ireland’s natural light makes for delightful photos – even when it rains. Golf, fishing, horseback rides, cycling and more await. Need to unwind? Head for the spa! Nestled on the lower level of the castle, immerse yourself in tranquility. The delicate fragrance of fresh cut flowers teases your nose. Candles and soft lighting soothe and calm. Time stops as you soak in the gazebo covered outdoor hydro pool. Skilled therapists coax the stress out of every muscle, leaving you delightfully limp. Whether you choose a stand-alone treatment or opt for a 2 to 5-hour package, you will emerge relaxed, refreshed and revitalized. Hungry? Visit the drawing room for Afternoon Tea. Fresh petite sandwiches, pastries, scones with clotted cream, fruit tarts and more. Enjoy with your favorite tea or a glass of champagne. Smoked salmon, Irish steak and succulent roast rack of lamb compete as dinner choices. Every meal delights your pallet. Dromoland Castle is a great home base for exploring. Head north to the craggy Cliffs of Moher and Galway. Let Bunratty Castle Folk Park take you back through time, to life over 400 years ago. If lucky, you might hear tales of Irish life from the storytelling lady who plays accordion there. Unsure where to go? The concierge is happy to assist with tour ideas. Over 30,000 castles dot Ireland’s landscape. Leprechauns and four-leaf clover hide in the mists. Discoveries await in every direction. Visit Dromoland Castle as the focus, the start, or to end your trip, it’s an experience of a lifetime. You will leave with new friends and lots of memories. Traveling on a budget? Go in the offseason or check out one of their specials. To learn more or schedule your stay, visit http://www.dromoland.ie/. If not for your writing this topic could be very coluvnoted and oblique. Next Next post: Is Britain on Your Bucket List?